Place water, shiitake and kombu in a sauce pan. Cover and bring to a boil. Remove kombu after 4 minutes and set aside for later use. Cover and simmer shiitake another 15 minutes. Remove shiitake, discard stems and slice caps. Set aside. Add the shoyu to the liquid and simmer, without boiling for 2 to 3 minutes. Turn off flame and stir in the wasabi powder. Place the broth in a bowl and refrigerate until chilled or place in the freezer to chill, about 1 hour. Cook the soba as package directs. Rinse under cold water and drain. 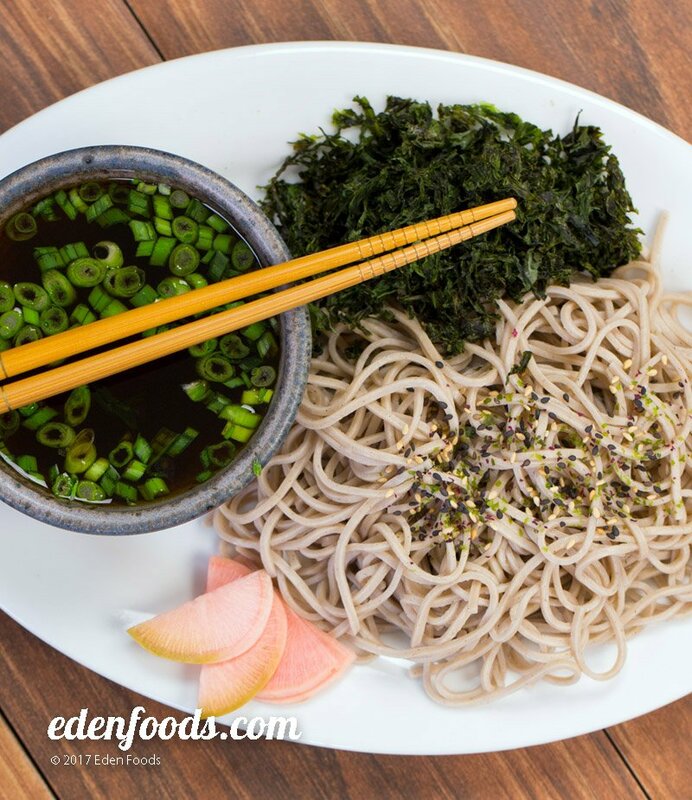 Place the soba in individual serving bowls. Garnish each bowl with equal portions of daikon radish, sliced shiitake, scallions, nori strips and bonito flakes. Sprinkle several drops of shoyu over the daikon in each bowl. Sprinkle with Eden Shake, if desired. Pour the chilled dip sauce into 4 small dipping bowls. Dip the noodles into the sauce when eating.